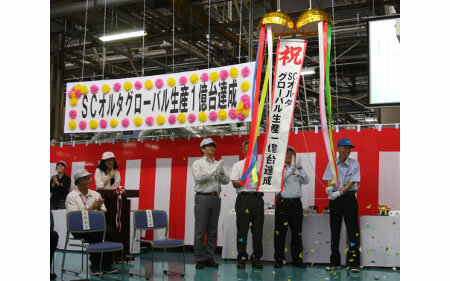 Denso today held a ceremony at its Anjo Plant in Aichi, Japan, to celebrate reaching the milestone of producing its 100 millionth segment conductor (SC) alternator, its flagship alternator and a major product for the company. Denso, which has supplied alternators since 1962, has been reducing the size and weight of alternators while also increasing their efficiency. Denso will continue to research and develop alternators with higher power generation efficiency to meet vehicles’ growing demand for electricity. In addition, DENSO also will use its accumulated technologies to develop alternators tailored to meet the needs of emerging countries for its customers around the world. Denso began producing its SC alternator in December 1999 and manufactures it in all major regions of the world, including Japan, the United States, Thailand, China, Italy, India and Taiwan. Since 1988, DENSO has held the largest share of the global alternator market. Currently, SC alternators account for 70 percent of Denso’s alternator production.